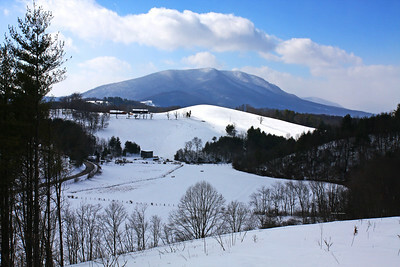 Long range winter view of Mount Jefferson covered in snow in Ashe County, North Carolina. 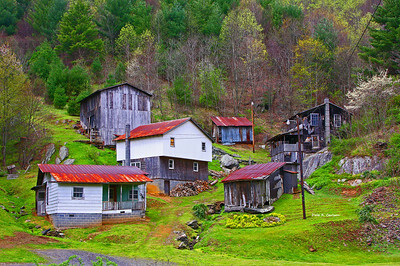 An iconic set of buildings set just off of Highway 194 north of West Jefferson, North Carolina. 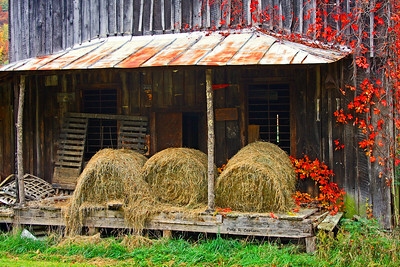 A farmer's unique storage place for surplus round hay bales in Ashe County, North Carolina. 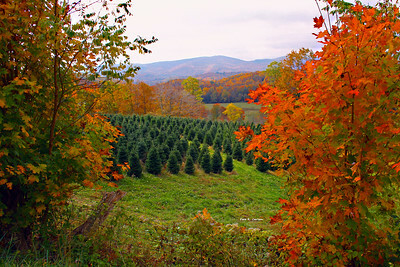 The largest agricultural crop in Ashe County, North Carolina - Christmas Trees! Ashe County produces more Christmas trees annually than any other county in the United States. 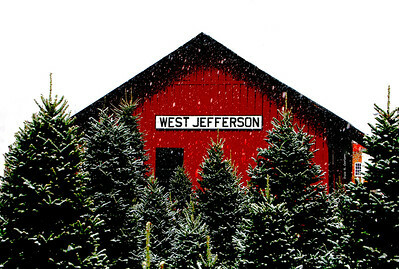 Fraser fir Christmas trees in new fallen snow frame the old train depot in downtown West Jefferson NC . Old general store on highway 88 in Ashe County, North Carolina. It still has the "Esso" sign and the logo "Happy Motoring". 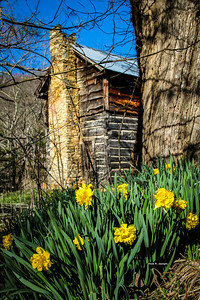 Daffodils still celebrate spring oustide an old log cabin in Ashe County, North Carolina. 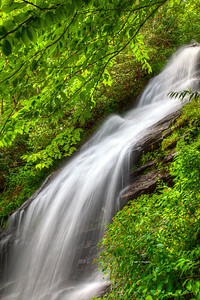 Cascade Falls - Cascade Overlook at milepost 271.9 on the Blue Ridge Parkway in Ashe County NC. 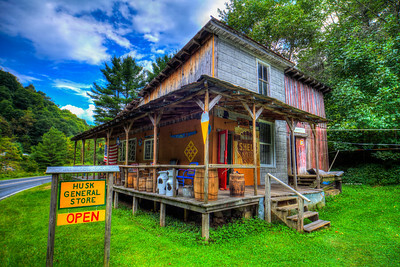 Phipps General Store in Ashe County NC. During the summer months, a great venue to hear and play bluegrass music on Friday nights. Long range vista from Pond Mountain in Ashe County North Carolina in the Blue Ridge Mountains. 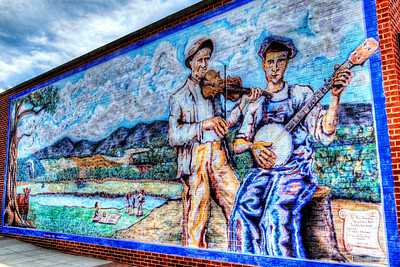 Wall mural in downtown West Jefferson, North Carolina entitled "New River Traditions" by Maryanne DiNapoli Mylet. 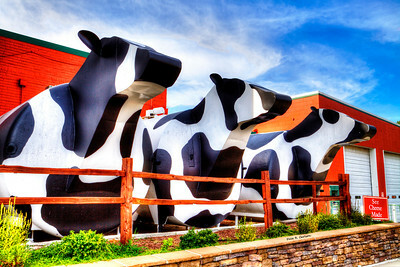 The iconic Ashe Cheese factory cows in front of their cheese making facility in downtown West Jefferson, North Carolina. Looking south on Jefferson Avenue in downtown West Jefferson, North Carolina on a beautiful summer afternoon. 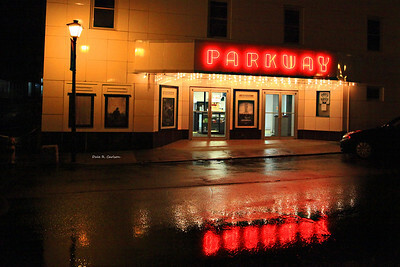 The Parkway "twin-plex" theatre in downtown West Jefferson, North Carolina with its neon light reflected in Main Street. Originally opened in 1947 with a single screen, it was convered to a "twin-plex" in 1978. They still show current films to this day. 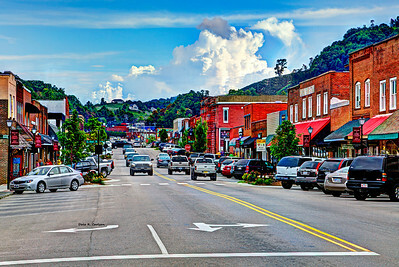 View looking north on Jefferson Avenue in downtown West Jefferson, North Carolina. 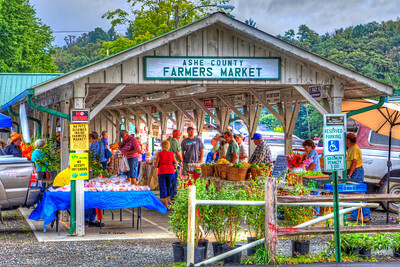 The Ashe County Farmer's Market in downtown West Jefferson, North Carolina. Open from spring to fall, they offer locally grown produce and many types of handcrafted items. 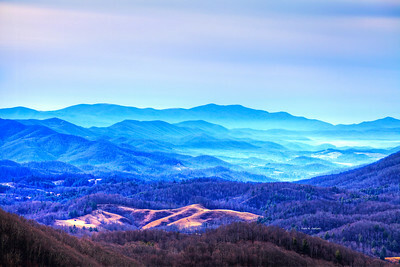 The north end of West Jefferson, North Carolina as viewed from the lower overook of Mount Jefferson. 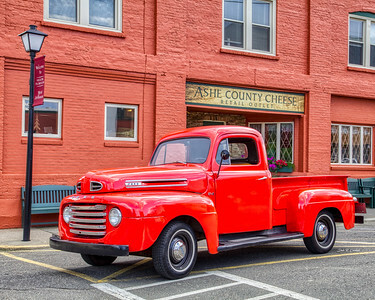 A fully-restored 1950 Ford pickup parked in front of the Ashe County Cheese factory in downtown West Jefferson, North Carolina. The old general store in the town of Husk, North Carolina. In former times, a stop on the Virginia Creeper railroad line. 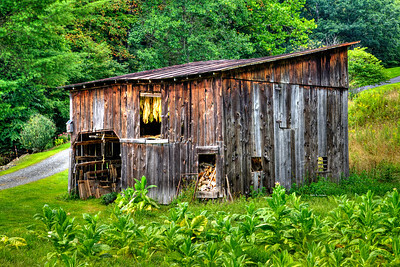 Tobacco drying in an old barn in Ashe County, North Carolina. Burley tobacco is still a common crop seen on the backroads of the Blue Ridge Mountains. 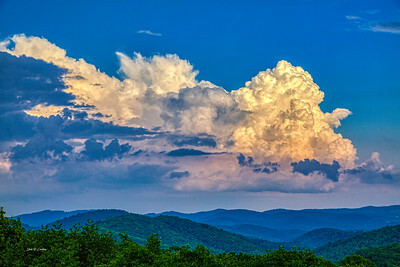 Thunderheads passing over the Blue Ridge Mountains of North Carolina during a summer storm.